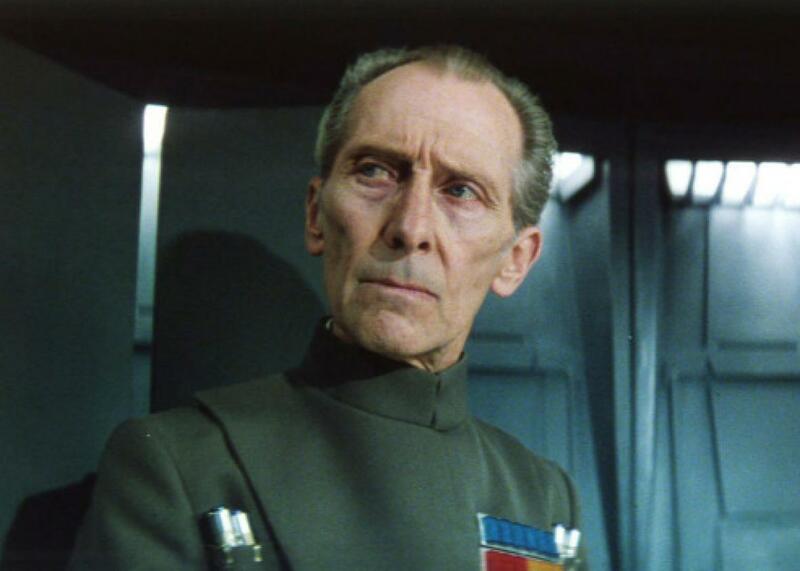 How Rogue One re-created the late actor Peter Cushing. How Did Rogue One Re-create the Late Peter Cushing? Peter Cushing as Grand Moff Tarkin in the first Star Wars. There are few, if any, ongoing film franchises more connected to the passage of time than Star Wars. It’s there in the dates of each release: 1977 to 1983 for the original trilogy; 1999 to 2005 for the prequels; and now, starting in 2015, one movie a year through at least 2020, including this year’s Rogue One. That’s more than 40 real-life years for the franchise to span onscreen, and 40 years of filmmaking means 40 years of human events, including the most human events of all: aging and death. The problem is particularly acute for Rogue One, which takes place shortly before 1977’s A New Hope and features a few of the same characters. In one instance, the movie addresses this problem in a more or less unprecedented way. Rather than recast the role of baddie Grand Moff Tarkin, once played by the late Peter Cushing, director Gareth Edwards and Industrial Light and Magic simply digitally re-created the actor. That’s the technical How of Cushing’s return. The legal How is a bit less straightforward. As CGI has improved over time, concerns have grown regarding actors’ rights to their own personas and likenesses, either onscreen or in video games. Netflix’s BoJack Horseman featured a storyline in its third season in which BoJack is replaced in a film by a digital re-creation of himself, having signed away those rights in his contract; he’s subsequently nominated for an Oscar, and the performance is praised as the best of his career. Meanwhile, digital plastic surgery and postproduction enhancement have become not only commonplace but expected, going so far, at least in one instance, as replacing an actor’s face with another’s after the performance was already in the can. But Cushing in Rogue One represents a more extreme version of the case: This is a deceased actor being made to look as though he’s giving a new, living performance. Is it ethical? Good question. Is it legal? Probably. Considering the stakes involved in a film the size of Rogue One, it’s almost certain that Disney did their due diligence in making sure that the use of Cushing’s likeness was legal; when reached for comment, a Disney representative pointed to two mentions of Cushing in the credits: “With Special Acknowledgment to Peter Cushing, OBE” and “Special Thanks to The Estate of Peter Cushing, OBE.” Actors’ union SAG-AFTRA, meanwhile, issued this comment: “Using a digital or virtual re-creation of a performer, deceased or living, in a film, television show, video game, or any other audio-visual work, requires, at minimum, prior consent of the performer or the performers’ beneficiaries. The issue for us is straightforward and clear: The use of performers’ work in this manner has obvious economic value and should be treated accordingly.” Either way, it’s safe to assume that this is only the first instance of what could become a major trend in filmmaking. Plumbing the past has proven a powerful tool for studios selling blockbusters: If franchises can be revived, why not actors, too?